Posted by Norbert Kamienski on September 21st, 2017 . Node_modules folder contains a few modules that are necessary for application to work correctly. 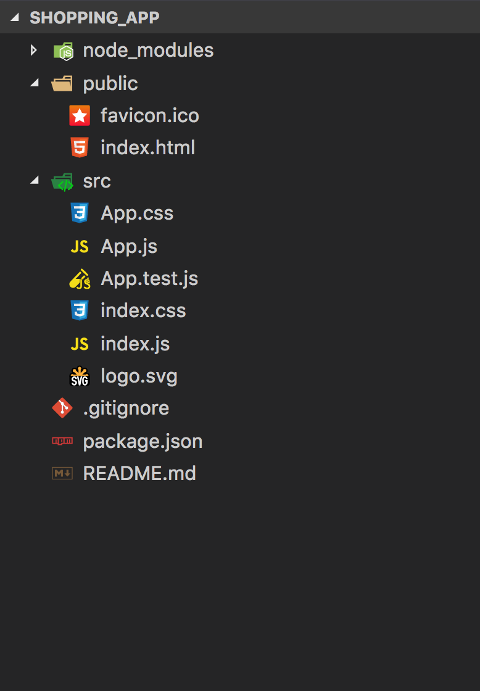 When we add something with npm command, we can find it in this folder. Next is src folder. It’s the main folder. Here is the whole application. There are components, tests and css files. We are going to add our components here. It’s only for development and when we want to build the application, webpack collects all of the files from this folder and creates a minified production bundle. There are three other files in the root folder. Gitignore contains informations about files that have to be ignored in git actions. Package.json includes some informations about our project, contains defined npm scripts and installed dependencies. The last one, readme is a project guide. Index.js is the main react component. The application has its start here. There are no spectacular calculations. At first, react, app and css files are imported. At the root of your tree you still have to write some plumbing code to our index.html. In the above example, we said that the react has to render our element which we imported at the top of the root element. Index.js don’t render any data. It’s only like a glue between our App and html file. The rendered data is in App.js file. Next part of this tutorial will explain what is a component in React.